Early Bird Tickets now open for 2019! Marie Holliday is delighted to showcase her sister Conference, The Animal Energy World Conference. The conference stems from a passion for all animals where people come together from all over the World to create this huge relaxed 'family-like' event created in love for animals throughout the World. The Conference now in its sixth year in 2019 consists of International Keynote & Guest Speakers alike who meet to share their skills, knowledge, passion and expertise in energy techniques, therapies, communication, psychology, essences, research and love for animals. Marie received a 'message' in 2013 which completely changed her life and the conference was born from this message about World Peace for Animals. Early Bird Tickets are now open for the Animal Energy World Conference taking place at the 4 Star Hallmark Hotel, Manchester on May 11th & 12th 2019. The venue is only 10 minutes from Manchester International airport and all major road and train links. It is pet friendly throughout welcoming dogs into the conference room, the VIP Gala Dinner night and bedrooms. They even have their own doggy delegate badges. Susan B. Eirich PhD, USA." Bringing Animal Individuality into Conservation Decision Making"
John Stuart Reid, UK. " The World of Animal & Dolphin Sounds imaged by CymaScope instrument"
Carlyn Montes De Oca, USA. "The Animal -Human Health Connection-and Beyond"
Carol Komitor, USA. "The Healing Touch for Animals"
Hugh Warwick, UK "Why Hedgehogs are the most important animal on the Planet" & VIP Gala Dinner speech "The Beauty in the Beast"
Elizabeth Whiter, UK. 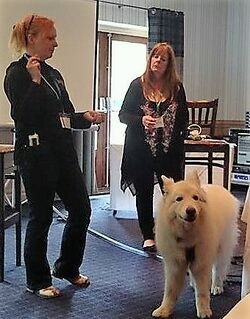 "A Masterclass Demonstration of Animal Healing & Conference K9 Guest"
Debbi Walker, UK " Animal Healing with Tuning Forks- Sound Medicine of our Future"
Ria & Henriette Roosendaal, Netherlands. " Essential oils for Animals & their Humans"
Masha Bennett, UK. " Gongs for Dogs & their Humans"